[ePalestine] Knesset passes bill...Anyone surprised? Racism at its best! “This is an important historic move that can balance Israel and bring us closer to the Christians, and I am careful not to call them Arabs, because they’re not Arabs." Critics slam law as effort to 'divide and conquer' Israeli Arab population. The Knesset on Monday passed a controversial bill into law that distinguishes between Muslim and Christian Arab citizens for the first time and increases the involvement of Christians in Israeli society. The bill, which passed its second and third readings on Monday, was sponsored by coalition chairman MK Yariv Levin (Likud-Yisrael Beiteinu). Critics slammed the law as an effort to “divide and conquer” Israel’s Arab population – an allegation Levin seemed to confirm in a recent interview with the newspaper Maariv. The law will have a minor impact on the makeup of the advisory committee that is appointed under the Equal Employment Opportunities Law, expanding it from five representatives of groups that promote workers’ rights under the law, to 10 members, which will include representatives of Christian, Muslim, Druze and Circassian employment groups. Those of you who know me personally know how much I respect the written word. It is in this spirit that I write you as part of my ongoing efforts to support Palestinian culture and arts, especially writing, and more specifically women writers. One of the up and coming woman writers whom I’m supporting is Fida Jiryis. Fida is from the Palestinian village of Fassouta, near the border with Lebanon. She is a dear friend and dedicated colleague. Fida recently wrote this article about Palestinians living in Israel. A few years back, she and I penned this joint piece about Land Day in Haaretz. 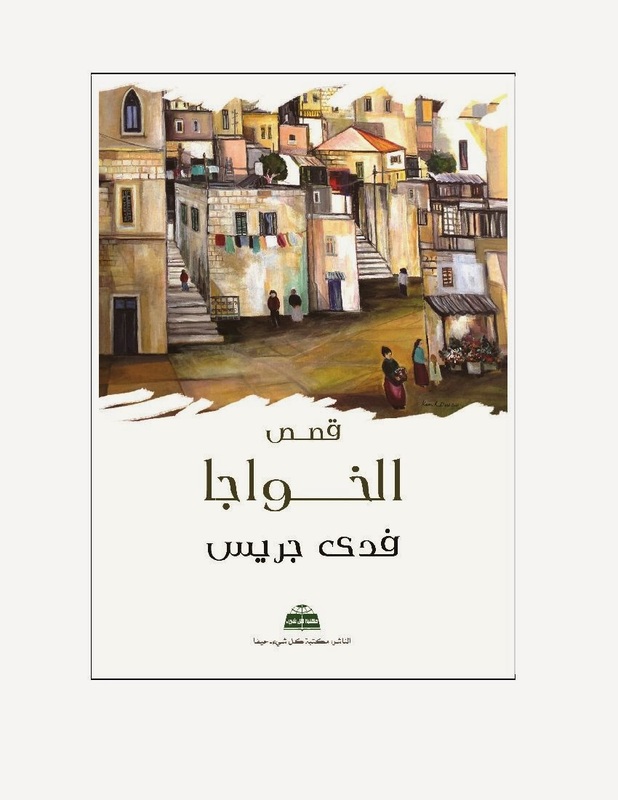 AL-KHAWAJA is a sequel to Fida’s first book of short stories titled Hayatuna Elsagheera (OUR SMALL LIFE). Both books depict daily life in a Palestinian village in the Galilee, which could be a village anywhere in the world. With wit, humor and an always present sense of reality, Fida brings villagers and their daily trials and tribulations to life in a light, comic setting. As part of supporting this new publication, I’m reaching out here to the Palestinian Diaspora communities and our communities of solidarity to help get this book distributed. The book is in ARABIC and is an easy read. We are asking for each community to commit to selling 10 or more copies. If you are not an Arabic reader, consider ordering the book and passing it on as a gift to those who are. The funds received from book sales are going to cover the costs of publication, distribution, and getting the book into Palestinian high schools, along with book readings. PLEASE PASS THIS ON AND TELL YOUR FRIENDS. P.S. Fida has also recently completed her first English manuscript of a non-political, women's fiction novel and is seeking to get it published, so we would be grateful to anyone who can link us to a publisher/agent. "Professor Krieger, who supports the B.D.S. movement, will not rise in synagogue for the traditional prayer for the state of Israel. "I think nationalism and religion together are toxic," he said." Professor Manekin, 61, became Orthodox in college and became an Israeli citizen in the 1980s. Yet in an interview this week, he denounced Israel's "excessive reliance" on military force, its treatment of Arab citizens and its occupation of the West Bank. Although not a member of the American Studies Association, he was pleased when the group voted in December not to collaborate with Israeli academic institutions  the "academic boycott." He is "sympathetic" to B.D.S., as the global movement to boycott, divest from, and sanction Israel is known. "As a religious Jew," he said, "I am especially disturbed by the daily injustices perpetrated against the Palestinians." From left, Daniel Boyarin of Berkeley, Corey Robin of Brooklyn College, Rabbi Alissa Wise and Charles H. Manekin of the University of Maryland, all observant Jews who have found that their views on Israel differ from those of family members and friends. The vast majority of Jews consider themselves supportive of Israel. They may quarrel with various Israeli policies, but since the state's founding in 1948, and especially since the 1967 war, Zionism has been a common denominator of world Jewry. And while there have always been anti- or non-Zionist Jews, today they cluster on the less observant end of Judaism, among secular or religiously liberal Jews. In such a world, Professor Manekin  a modern Orthodox Jew in a skullcap whose religion moves him to oppose Israel  is exceedingly rare. Zionism was not always the norm among American Jews. Nevertheless, those committed to Jewish practice but openly at odds with Israel are now likely to find themselves at odds with their friends and family. In the past couple of months, events like the American Studies vote and the endorsement by the actress Scarlett Johansson of a seltzer-maker in the occupied West Bank have multiplied the opportunities for tense family dinners. Professor Manekin spends about half the year in Israel, where his children and grandchildren live, so he is hardly boycotting the country with his own dollars (or shekels). But since 2007 he has regularly offered criticisms of Israel on his blog, The Magnes Zionist. It is named for Judah L. Magnes, an American rabbi who, until his death in 1948, argued that a Jewish return to the Middle East did not require a nation-state. "People look at 'non-statist Zionism' as the type that lost," Professor Manekin said this week, referring to Rabbi Magnes's philosophy. "But I found a lot of what they were saying resonated today, and a lot of their predictions about endless war had come to pass." Stefan Krieger, 67, teaches law at Hofstra University, on Long Island. He refrains from work on the Sabbath, keeps kosher, and studies a page of the Talmud every day. But his views on Israel have always been unusual. "My parents were very sensitive to the issues of Palestinians," Professor Krieger said. "My mom had a book called 'They Are Human Too,' and my memory is she would take it off the bookshelf, as if this was some sort of scandalous tract she was showing me, and show me pictures of Palestinians in refugee camps." Professor Krieger, who supports the B.D.S. movement, will not rise in synagogue for the traditional prayer for the state of Israel. "I think nationalism and religion together are toxic," he said. So far, he said, the fallout has been minimal. "I was worried it would destroy some relationships. I don't think it has yet." At a synagogue Professor Krieger used to attend, one woman would not enter the sanctuary when he was seated on the bimah, or stage. When he placed some literature from Rabbis for Human Rights, a liberal Israeli group, on a table, "she threw it out." Alissa Wise, 34, grew up in Cincinnati, in what she calls a "modern Orthodox or Conservative kind of background, a very right-wing Zionist background." In 1999, she arrived at Hebrew University in Jerusalem. On her first day of classes, there was a pro-Palestinian rally on campus. Rabbi Wise  she was later ordained in the Reconstructionist branch of Judaism  was shocked to learn of the West Bank occupation. "I had gone to Jewish summer camp and Jewish day school my whole life and had no idea," she said. "I still believe the way I believe," said her father, Ron, who works for Osem, an Israeli food company. "I am open to how she believes, and I listen to her." But, he continued, "At the same time, Israel needs to be protected." "The very concept of a state defined as being for one people was deeply problematic and inevitably going to lead to a moral and political disaster," said Professor Boyarin. "Which I think it has." Professor Boyarin, 67, is still observant, but he has dropped out of synagogue life. "I have been so disturbed by the political discourse," he said, "that I felt that I couldn't participate." Skepticism toward Zionism used to be common. Before World War II, Reform Jews tended to believe that they had found a home in the United States, and that Zionism could be seen as a form of dual loyalty. Orthodox Jews generally believed, theologically, that a state of Israel would have to wait for the Messiah's arrival (a view some ultra-Orthodox Jews still hold). In the 1930s and '40s, the persecution of European Jews turned many American Jews into Zionists. Major organizations, like the American Jewish Committee and Hillel, the Jewish campus group, turned toward political Zionism after the war. "When Hillel was founded, it took a clear non-Zionist position," said Noam Pianko, who teaches Jewish history at the University of Washington. "What you see is a shift in the American spectrum: from non-Zionism with a few Zionists, to a situation, by the 1960s, where the assumption is that any American Jewish organization is also going to be clearly Zionist." Corey Robin, 46, a regular at a Conservative synagogue in Brooklyn, writes a blog about his opposition to Israeli policy and his support for the B.D.S. movement. "There are lots of ways to be Jewish, but worshiping a heavily militarized state seems like a bit of a comedown from our past," Professor Robin, who teaches political science at Brooklyn College, said in an email. He said that he tries not to get into arguments with friends, but he has become very "vocal and visible" in his writings. In response to such views, Professor Robin is often accused of despising Judaism. "As my mother, who is very pro-Israel, will tell you, I love being Jewish," Professor Robin said. "I love when I'm walking down the street, and my 5-year-old daughter's skipping next to me, singing to herself some tune in Hebrew that we sang in shul. "I can't listen to that tune and the words we sing when we close the ark without a shudder. I love being Jewish. I just don't love the state of Israel." A version of this article appears in print on February 15, 2014, on page A19 of the New York edition with the headline: A Conflict of Faith: Devoted to Jewish Observance, but at Odds With Israel. Preferential treatment of Israel has, sadly, come to be expected in the United States. Too often, the United States turns a blind eye as Israel discriminates against American citizens, then rewards Israel for this unacceptable behavior. The so-called visa waiver bill would reward Israel by allowing Israelis to travel to the United States without a visa — a privilege that is supposed to hinge on Israel reciprocating the gesture. What’s wrong with BDS, after all? Israel will be helpless when the discourse moves from who’s stronger/tougher/more resilient to a discourse on rights and values. Talk of sanctions has been filling the air lately. Israelis, as always, are certain that the whole world is against us (psycho-national nonsense that will be more broadly discussed here in the future), and that all the world’s overt and covert conspiracies are focused solely on us – out of hatred and anti-Semitism, of course. Few notice the wonderful paradox whereby official Israel, together with mobilized world Jewry, fights the scourge of sanctions by whining and screaming anti-Semitism, Holocaust and Jew-hatred in chorus. Yet in the very same breath these exact same people utilize any possible tool to advance and intensify the sanctions against Iran, as they did against Hamas until recently. And with useful diplomatic hypocrisy they make every effort not to hurt Syria’s Bashar Assad too much, or Egypt, or another few corrupt targets of Israel’s foreign policy. Meanwhile, the Palestinian boycott, divestment and sanctions (BDS) movement is gaining momentum and is approaching the turning point (rather slowly, it must be said) in which the civic action from below will meet the official policies of governments and parliaments from above, and sanctions against Israel will become a fait accompli. Israel’s finance minister is troubled by the economic consequences, while the American secretary of state is trying to protect us from international isolation. Research institutions are already mapping out their boycotts and sanctions while offering avenues for formulating appropriate Israeli policies. The media are also making their serious or frenzied contributions. Among all this talk, what is conspicuously missing is a real discussion of the ethical meaning of sanctions and their alternatives. Personally I’m a man of dialogue and believe that a boycott – any boycott – is not a legitimate tool. When my prime minister leaves the room as the Iranian president is speaking, I can’t decide whether he’s an idiot or just being childish, but what’s clear is that he doesn’t represent me at all. I believe in peace and I have no doubt that proper (if pointed) dialogue with the Palestinians will in the end bring two achievements: peace, and the end to the boycotts, ostracism and isolation under discussion. It’s the same with the Iranians, and even with Danny Danon. But those who don’t want peace, or who want it but don’t trust the partner, or who want and trust but don’t have the public courage to stand up to the enemies of peace among us, must ask themselves different questions altogether. It’s clear that there’s a connection between the diplomatic reality and its economic manifestations. It’s permissible – despite the evil and folly of that approach – to decide that it’s worth holding the occupied territories, if only because at this point the price of international isolation or the harm done to the pockets of Mr. and Mrs. Israeli is not so terrible. After all, in the end, national policy is a system of constantly balancing risks and rewards, and for now – they say – the risks are tolerable. But everyone else – the political impotents or the merely indifferent – needs a different approach. Put yourselves for a minute in the Palestinians’ place and try to understand what Israel “allows them” and consider what you would do in their position. A violent Palestinian rebellion? No way! Totally out of the question, not least because it will be put down by a much more violent force. (It’s an undeniable fact that more innocent Palestinians have been killed by Israel than innocent Israelis killed by Palestinians). A diplomatic agreement? You’ve made Naftali Bennett’s rear end and Benjamin Netanyahu’s lost senses laugh. So then what? Nothing? Should they just say thank you and shut up? Would we remain silent and capitulate unconditionally if we were in their place? Suddenly it turns out that the boycott movement is not just an annoying effort to hit Israelis in the pocket, but a bold and innovative attempt to achieve real diplomatic gains. And in the areas in which I firmly believe require dialogue and solutions: an end to the occupation, the destruction of the separation barrier, recognition of the rights and equality of Israel’s Palestinian citizens, and a solution to the refugee problem. It’s a local and international expression of a totally different type of Palestinian struggle, something new and not so familiar to us – nonviolent resistance. Is that also forbidden? What emerges from all this is that of all the alternatives being suggested – as if anyone is asking us or has to care what we think – boycotts and sanctions are actually the most kosher. Silencing and repression are bad, and violence is worse. Compared to either method, nonviolent resistance and an unarmed popular uprising don’t sound so bad. The truth is that not all of their people are behind this (just like not all of our people support us), but the direction being outlined is clear, convincing and threatening. Deep down I’m convinced that the tough State of Israel has a response to any expression of force it may face. But it will remain helpless when confronted by a civil rebellion that moves the discourse from who’s stronger/tougher/more resilient to a discourse on rights and values. For this we have no answer. What will the politicians and soldiers of the racist separation do on Hebron’s Shuhada Street, which is closed to Palestinians, if a thousand kids come with their bikes, soccer balls and cameras and ask to play on the street in front of their homes – a basic right of any normal child on any street in the world? What will be the response of the Sensible One if the parents of those children, along with hundreds or thousands of other people (me and my family among them) come to the wall of the Palestinian ghetto (known euphemistically as the separation barrier) and hold a vigil there before the international media, under clouds of tear gas, until it comes down? The answer is clear. On the very day that nonviolence becomes Palestine’s official policy, Israel’s violent occupation policy is over. The current hysteria over boycotts and sanctions testifies to this. Avraham Burg is former speaker of the Knesset.